PLAZA MAYOR-PUERTA DEL SOL-LUXURY -NEW- Apartment Design, Luxury Center. LUXURY APARTMENT IN THE DOOR, NEW EXTRENAR. Up to 5 guests. 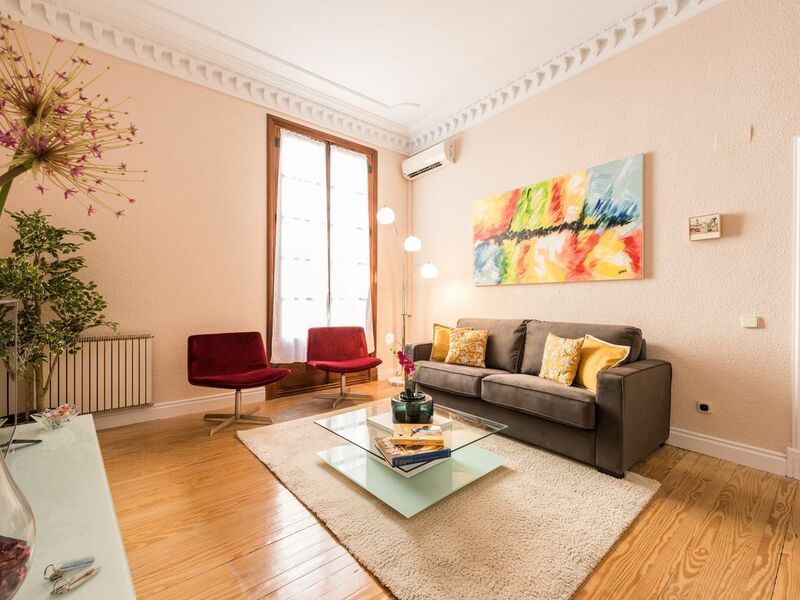 Luxury apartment in the Puerta del Sol and next to the Plaza Mayor, the Royal Palace and the best museums, theaters and shops in the city, Restaurants, Tapas. Logically well connected and close walking distance to all the sights of Madrid. It has 1 large bedroom, 1 full bathrooms, large living room, kitchen. Is located on the second floor is very bright. The building has two elevators. Fully equipped for your comfort with: Air Conditioning and Heating, Smart TV, WiFi 300MB free. The apartment has everything necessary for accommodating up to 5 guests, bedding, toalllas, crockery, dishwasher, microwave, hair dryer, etc. so that you feel as comfortable as in your own home. We rent this great apartment of 100 m2 newly renovated (August 2016), 4m high ceilings, sunny, central and charming and luxury. It is on the street Marques Widower of Pontejos in Puerta del Sol, the city center, within walking distance of the most interesting places in Madrid. It is the perfect place if you are looking for quality accommodation, economical and quiet in the city center, to feel at home. You can walk to most places of interest in Madrid. The apartment is on the second floor of a stately building with elevator. The furniture and all the equipment is new, quality and design. It is therefore an apartment with all amenities and is perfect for rest at night after a long day of sightseeing. * Queen Room (king size), large wardrobe, mirror, Descalzador, etc. * Possibility of 1 extra bed in the bedroom. * They can accommodate up to 5 guests. * Fully equipped with everything you might need for cooking and eating in the apartment. It includes hob, oven, microwave with grill, washing machine, coffee / tea kettle and toaster, coffee machine and various utensils. * Lounge / Dining room with sofa bed (140cm) seats and all amenities, with SMART TV. in short everything you need to feel at home. 1 additional bed (90cm) can be placed in the same dormitory. Guests have the entire house. Guests are alone and your air during the stay, have our phone for anything they need. In spite of being in Puerta del Sol, it is located in, ideal for rest without noises in the night quiet street. Guests can experience the famous nightlife of Madrid from its own center and all amenities. The apartment has been completely renovated and furniture and kit is totally new to EXTRENAR. SECURITY DEPOSIT: The guest must provide a deposit of 200, - € in cash or card will be refunded upon departure. Perfect location, very nice place with a great bathroom. Longing for hot water and water pressure? Plenty of both here! Our stay with Angel was wonderful. The place was clean and spacious. The location was perfect and Angel was a wonderful host. The only thing keeping this from being a five star review was that we didn't have hot water in the shower for more than a few minutes for the first two days. Angel came to fix it though the second day and was sympathetic. Nice location. Conveniently located to everything. However, the apartment needed more supplies. There weren't enough towels, kitchen supplies and the hot water didn't last long when taking a shower. Only enough hot water for 1 person to take a shower. Jeffrey, your comment about my apartment has not been very good, I'm sorry but I can not agree. Towels you had available 4 for 5 nights, I think that's enough. Regarding hot water and supplies, nobody ever complained before. However, thank you very much for your stay. This was my husband’s and my first trip to Madrid en route to Nerja. We stayed three nights at this location which was perfect. Our host was amazing and everything was perfectly executed in terms of meeting us at the apartment, familiarizing us and providing local recommendations. In addition, he made himself available 7/24 should we have required it. He checked in the day before we left to ask if he could arrange a taxi to the airport on our behalf which was so appreciated given our very limited Spanish. The apartment was very clean, well provisioned, good internet and lots of heat and hot water. We were able to walk to all major attractions and areas of interest and were close to many eating establishments. Overall, an excellent spot to rent and we would certainly return for another stay. Thanks for your stay ! Convenient, comfortable, spacious & great host! Angel was very attentive and checked on us mid week. We appreciated his recommendations, thoughtfulness & welcome touches. We felt very comfortable and at home. We had such a great time in Madrid and staying at Angel’s place was perfect. The location is great and central to everything, and all of the amenities were good as well. Thank you Angel! The apartment is located in the center of the city in the Puerta del Sol and Plaza Mayor together.